Juno is a definitive moment in the history of the indie film. It took all that came before it, in the vein of films like Garden State, and made the genre entirely its own. It was not the first indie film, but from this point on any quirky, independent movie with a hip, cool soundtrack will be compared to Juno. This is not necessarily a bad thing. 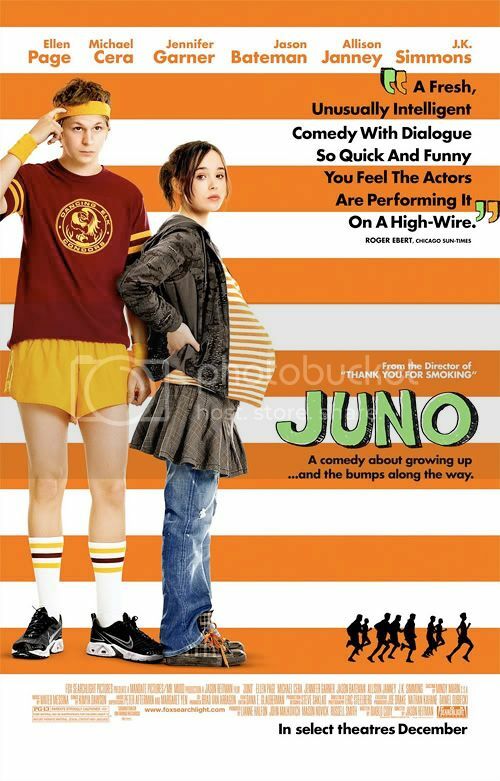 I remember enjoying Juno greatly when it first came out. Not as much as my wife, whose fault it is that we have watched it several times since. On multiple viewings, however, it has not held up as well as its potent first impression. Juno is a very snappy picture, with dialogue and a screenplay that have been honed. Diablo Cody may have won the Best Screenplay Oscar riding on the hype Juno had been gathering, but that doesn’t change the fact that it is a very taut script. I can understand how some of the dialogue might be too hip, witty, and sharp for some people to find believable, but if you sit down without any preconceived notions you will probably enjoy the film. The reason lies in the strength of the unique characters. Not only Juno, but the supporting cast is strong as well. Juno, being the titular character, sets everything in motion. 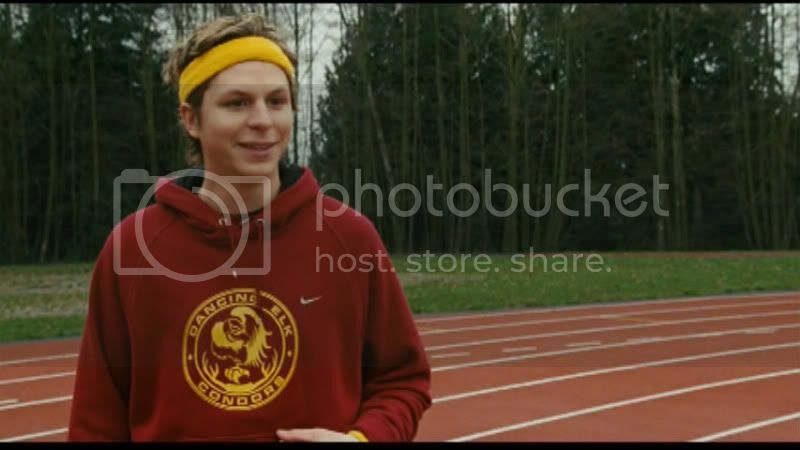 Played smartly by Ellen Page, Juno is in high school, fresh off a summer fling with Michael Cera, played by Michael Cera in the role he has been perfecting since the days of “Arrested Development.” His name in this film is actually Paulie Bleeker, but if you’ve seen Cera in anything you know the character. After their one-night sitting (in a chair) Juno discovers she is preggers. With her best friend, Leah (Olivia Thirlby), she tries out her various options. The abortion clinic rubs Juno the wrong way, so she decides to find an adoptive family to take her little bun when the oven dings. This couple comes in the form of Jason Bateman and Jennifer Garner, as Mark and Vanessa. They haven’t been able to have kids of their own and are excited about the opportunity. Actually, Vanessa is, but Mark might be having some second thoughts. Juno enters their life in a rather disruptive way, and her relationship with Mark eventually veers into slightly awkward territory. As the film progresses Juno grows up much faster than she had anticipated, learning that the world is a whole lot more complicated than she first thought. Page’s performance is subtle and nuanced, and she was deserving of her Best Actress nomination. Garner also has a difficult job making the obsessive-mother character likeable, but she pulls it off with an honest performance. Allison Janney and J.K. Simmons, as Juno’s step-mother and father, are also quirky and sympathetic as they are forced to deal with the unexpected news of their daughter’s doodle-that-can’t-be-undid. Juno has received a great deal of undeserved backlash after its initial warm reception. People started thinking it was overrated and over-the-top as far as the witty dialogue is concerned. If viewed on its own, however, it holds up as a smartly made film about some interesting and likeable characters. While I haven’t enjoyed it as much on multiple viewings as I did the first time, it is still a fun movie. If I had to give it a star rating based on the fifth viewing, it would probably be three stars. The film’s strong initial impression and talented production, however, make it a three-and-a-half star film. This entry was posted in 3 pirate flags, 3.5 stars, J, Movie Reviews on December 29, 2009 by Tim Irwin.